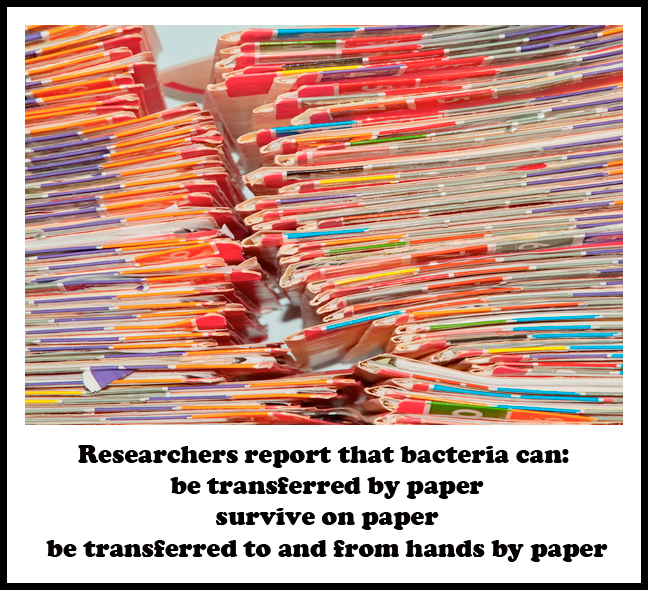 Paper can transfer bacteria too – hand to paper and back again – microBEnet: the microbiology of the Built Environment network. We recently wrote about moldy documents in French archives and a higher incidence of asthma among workers who handled documents than others working in the same spaces but not handling them. See our previous post: “Hands off the moldy docs (for your own good? 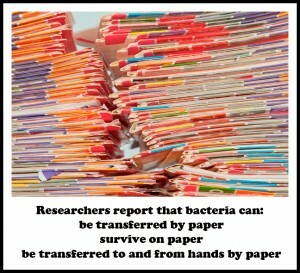 )” Now we find researchers reported that bacteria can also be transferred by paper, can survive on paper, and can be transferred to and from hands by paper. Four common organisms were tested on paper — Escherichia coli, Staphylococcus aureus, Pseudomonas aeruginosa, and Enterococcus hirae. The results were reported in the American Journal of Nursing, focusing on medical records and nursing professionals who must handle paper materials in spite of a major shift to digital record keeping. Environmental conditions affected the survival of the organisms, the researchers reported. They also found “…the transmission rate found in a full hand-to-paper-to-hand cycle fits well with published data on transmission rates to and from other inanimate surfaces.” So switching to tablets or other digital devices may not improve the control of pathogen transmission from hand to object and back to hands.